This condo is newly renovated and redecorated. It is a perfect place to retreat with family & friends. The kitchen is well equipped and it is also a great spot to enjoy company because the kitchen is open to the living space. The warm and inviting living room has plenty of comfortable, deep seating and all can enjoy the views of the mountains or a burning fire in the stone fireplace. Each of the bedrooms are spacious and all have new beds, bedding, and mattresses. 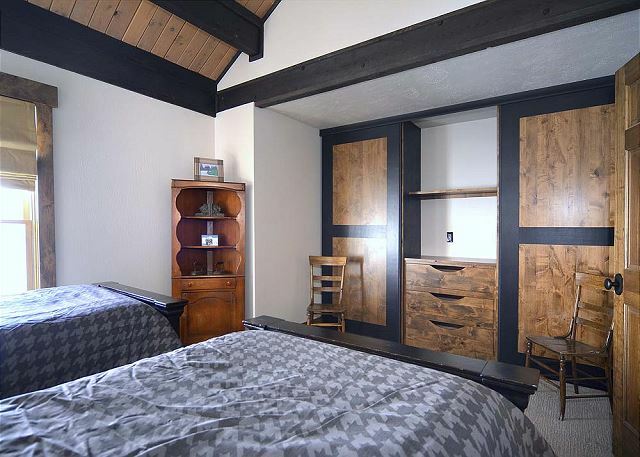 Downstairs, there is a lovely master bedroom with a king bed that was custom made in Crested Butte, this bedroom also has a TV. 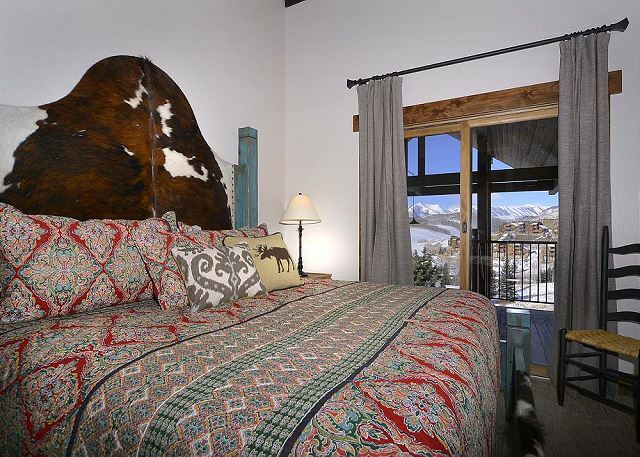 The second king bedroom features a bed that has a cowhide headboard and turquoise bed posts, also made locally – giving it a unique Crested Butte flair. The third bedroom downstairs has two twin beds. The upstairs area has a bedroom with two twin beds and the loft has two queen beds, which also includes a TV nook and club chairs. This is a 4 bedroom condo with loft. The main level has 3 bedrooms. The main bedroom has a king, second bedroom has a king with a sliding glass door to the balcony, and the third bedroom has 2 twins. The upstairs loft has 2 queens and the loft bedroom has 2 twins. There are 2 bathrooms downstairs and one in the loft. 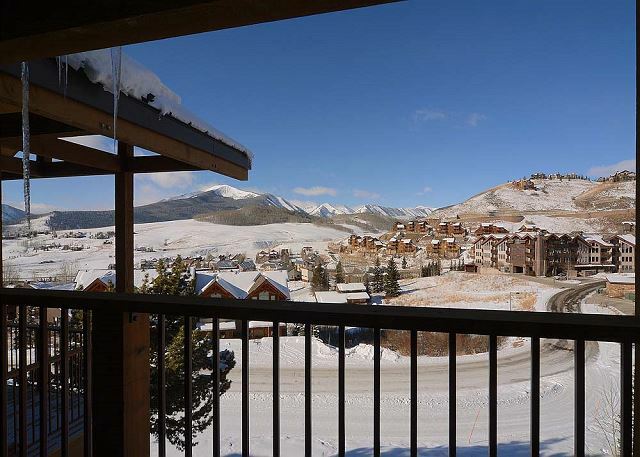 Getting out the door to ski is quick & simple, this condo is on the mountain side within the Keystone complex which lends itself to an easy ski down to the West Wall lift. Ski in/ski out. Nicely updated large condo. Two of the 4 bdrms have twin beds. Upstairs open loft area has 2 queen beds, so no privacy, but small, private bdrm upstairs has twin beds. Should be the other way around. 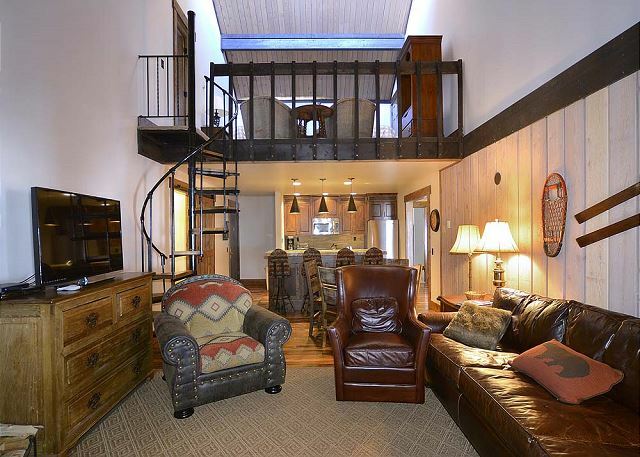 Tiny, spiral staircase to upstairs is not toddler friendly or tired, ski-leg friendly. Also, hit our heads several times on protruding steps. However, it is a lovely, comfortable place with comfortable beds. The lighting in all rooms is totally too dim for reading, playing board games, & seeing. Need to step that up. Minor cost in buying some more lamps. The parking lot was a disaster. Deep ruts if ice, which turned into deep pools if water. Cars & trucks were constantly getting stuck. Not to mention, it made walking very hazardous. It is a great location for ease of getting to the lifts & walking the dog. Can&#x2019;t wait to go back! Great location. Ski out was fun to the west lift. We used the shuttle so much; it was immensely helpful! Loved the beds and rooms. Great overall experience. Condo is updated, in an excellent location, with with awesome staff always ready to help. We stayed at this property for four nights and thought it was a great rental. There was more than enough space for our party of 5, and think we could have easily fit many more if we had a larger family vacation. The place was clean and generally up to date. Everyone in our family agreed that the beds were amazingly comfortable. As other reviews have noted, the unit is a little dark - even with lights on - so that would be our only (minor) complaint. The location is perfect for walking to the ski resort and only 5ish minute drive from the old town. We would definitely stay here again. It was a good place to stay, its in great condition, with excellent fitout and all kitchen needs- some suggestions, probably worth highlighting there is no air condition as we were looking for the controls, took a while to figure out there was none. Need to let air in at night but cant do that easily via main windows as they are actually large sliding doors and there is no lock on the screen doors which open onto a common balcony so we were not comfortable leaving door open at night and it got stuffy. Perfect location and layout for two families! We had more than enough space for two families to share this nice condo! It was very spacious and nicely decorated, and the beds were comfortable. It was such a nice location with lots to do within walking distance! We would definitely be interested in staying here again. My only two recommendations that would make it even nicer is if there was a washer/dryer in the condo and if the condo had more kitchen utensils (flippers, spatulas, sharp knives for cutting fruit, cutting boards, etc.) I am also used to rentals having more long-term foods available for use (tea, coffee, sugar, salt, pepper, spices, etc.) Not necessities by any means, but would have been nice to have available. Thank you for letting us stay at your condo! Wonderful condo! Perfectly comfortable for our family of 10. Very clean. Awesome views from deck! great time, perfect lodging at a very reasonable price. We had a great time. Loved having the housekeeping service. Lots of beds! The condo is alittle dark - could use a couple more lamps and higher watt light bulbs. Nice to have a ski closet right outside the condo. It is good ski out in the morning but a little more difficult to ski in for beginners - but just a very short walk if you decide not to ski-in. Great place to stay and the condo has been updated recently. Staff was very friendly and eager to make our stay enjoyable. The use of the free shuttle service was invaluable as we did not have to start our own vehicles the whole time that we were there. Great location! Ski in, ski out allowed for return for lunch, checking up on non-skiers etc. Lighting throughout the condo is inadequate, especially in den and master bedroom. Could use a larger chest of drawers in master bedroom. All the white coffee cups in kitchen were chipped and should be replaced. Staff was very helpful. Thoroughly enjoyed our stay and would definitely return.